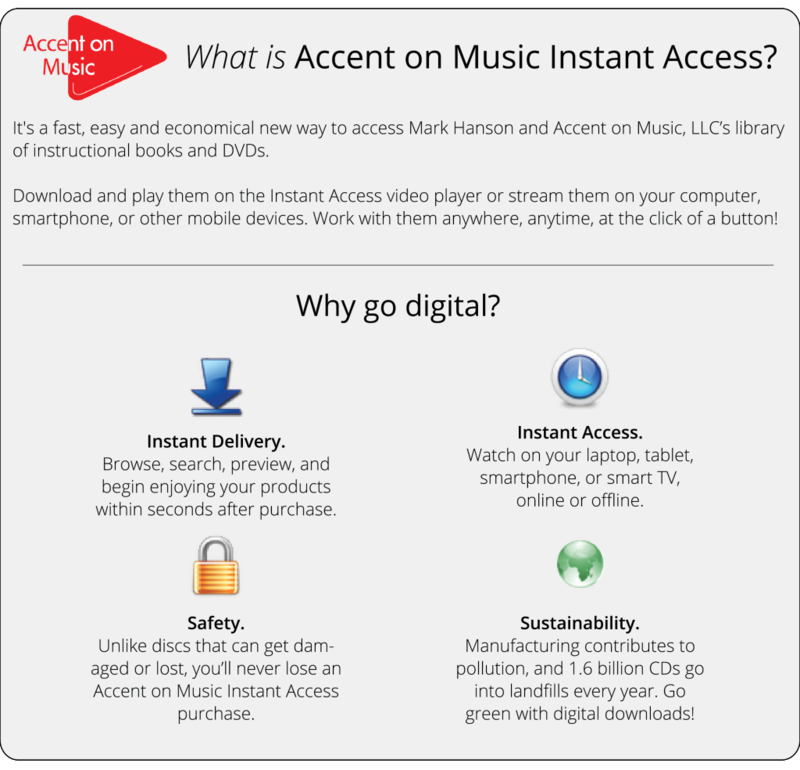 – What is Accent on Music Instant Access? – What is Platform Purple? – How do I browse and purchase lessons from Accent on Music Instant Access? – How can I watch my purchased lessons? – What if I have another question about Accent on Music Instant Access? Platform Purple is the company that provides the digital delivery platform on which Accent on Music Instant Access operates. After you download purchases, charges will show up on your credit card statement as “Platform Purple, Inc.” Platform Purple handles all technical support as well. How do I browse and purchase lessons from Accent on Music Instant Access? Just click the button below to launch the complete shop. Click the categories to the left to browse by instrument, style or teacher, and type in the search box to instantly filter the list and find what you’re looking for. Click “more info” to watch a preview and for more details about a lesson you’re interested in. How can I watch my purchased lessons? You can access your video library anywhere, anytime, on your laptop, desktop, tablet, smartphone or smart TV. The first way to enjoy your lessons is by downloading them. Downloading will always give you perfect playback, even if your Internet connection is slow, intermittent, or you are offline completely. You can download your lessons on Windows & Mac computers, iOS devices like iPads, iPhones and iPod Touches, and Android tablets and phones. If you have a fast, consistent Internet connection, you can go to our CloudPlayer in just about any browser on almost any device and view your whole collection. It will always be there, ready to stream so you can learn, practice and play along just about anywhere there’s Wi-Fi. What if I have another question about Accent on Music Instant Access? On this help page, you can get instant answers through a searchable FAQ, live chat with support and, if you have a technical issue, open a support ticket. The Purple support staff will work with you to resolve any problem, no matter what it takes. During U.S. business hours and evenings, you will usually get a reply within 15 – 30 minutes. Please let the Purple people know if you have any suggestions on improving your experience with Accent on Music Instant Access! Hi Dom, which product are you curious about? Some of the books and DVDs are available for purchase both in hard copy and digital, while others are only available in hard copy.